So Little Miss 11 is now in High School in Year 7. And I think like many other kids who enter High School, or perhaps its the transition from a single stream to a large high school with many new opportunities, she wants to try nearly EVERYTHING! Yep, she’s actually volunteering and trying out for soooo many things it’s as if the world is going to end tomorrow! I think it’s fantastic – of course we’re making sure she doesn’t get burnt out and I’m sure the enthusiasm will drop after a while, but it’s so amazing to see your child take that step growth in confidence. I’m currently reading a book about staying connected to your teenager, and it mentions the “two” people in your teenager – the “child” that you probably see at home, and the emerging “adult” that as a parent you don’t see much, but it’s the one that’s developing at school, etc. And last night, we had yet another glimpse at the “adult”. Little Miss 11’s high school was organising a talent night, something like X-Factor, or Australia’s Got Talent. And Little Miss 11, in her year of trying everything, signed up! The first we heard about it was two nights ago, when she told us to come watch her perform her duet the next night (last night). Immediately my helicopter parent questions started nagging at me – What the?! Duet? Who is she singing with? Does she know the other girl? What are they singing? Why is she singing? Have they practised? I haven’t heard her practise at home? Will she be OK on stage? Does she have a backing track? But Wifey reminded me to back off – I need to learn to let go. Little Miss 11 can handle herself, or at least, needs to learn to handle herself. So last night we turned up at the school, I’m a little anxious. We walk in and the whole auditorium of ~400 seats was full! OMG!!!!!! And not just of random parents, but mostly students, her friends, her peers! Little Miss 11 did go on stage, and sang really well with confidence! It was so cute, she was soo small, compared to the older high school kids. When she and her friend finished, the auditorium of school girls all erupted with huge applause, and that was the immense confidence boost that she needed. Her act didn’t win – but that didn’t matter at all. I’m most proud of her actually just signing up and having the guts to follow through! I think I would have pulled out once I saw the crowd there. All the way home and whilst downing some supper at home last night, she couldn’t stop talking about it. All this from someone who is usually now subdued or answering in monosyllabic grunts. Despite them having watched hundreds.. no.. probably thousands of hours of movies and TV, there’s still much that they hadn’t seen yet. I was thinking of filling them up on classic movies from when I was a kid. Yep, daggy. But staples that I think all kids need to have watched. We could finish off the Star Wars movies. Maybe venture into Indiana Jones although maybe I’ll leave that for when they’re older. They hadn’t finished seeing the Goonies yet. Hadn’t seen ET, but it might freak them out. Move onto Back to the Future 2 or Karate Kid 2 as they’ve seen the first ones? But I remembered, they hadn’t seen Superman yet. Yet Superman is still part of modern culture – in song lyrics, sayings, etc. Superman it was. And it was slow to start. Veerrrryyy slow. I think movies back then were directed, edited and screenplayed at a much slower pace – they definitely wouldn’t be releasing something like that nowadays. I tried to keep the kids enthusiasm and interest up, “Just wait – it gets better!”. Well, I’m sure it does.. when he flies and all that right? And then Superman flies out of his ice castle! I’m happy – surely the kids need to see this momentous occasion in the movie. But they laughed!!! “That looks soooo fake!” Miss 11 points out. Hmm.. yes it is. Why didn’t I think that at their age? Their standards are definitely higher than mine were. The groans continued as Superman did more tricks, flew above the clouds, drilled into the ground, etc. Then when Superman turns back time to save Lois, Miss 11 points out a major plot flaw – “What happened to the earthquake and the other damage?” “Good question” I had to answer. I don’t know! Superman definitely didn’t go back beyond the time when the rocket hit the fault line. Then it was all over with rousing John Williams music that the kids said sounded like Star Wars. The final verdict? “Boring” says Miss 10 and Miss 11. Oh well, at least they’ve seen it – I can cross that one off the list. I’m pretty confident I won’t get to choose the next family movie for movie night. Have you made your kids watch your childhood favourite movies? Were they as good as you remembered? Last week, WSJ blogger Amy Chua posted a controversial post titled “Why Chinese Mothers Are Superior” (http://online.wsj.com/article/SB10001424052748704111504576059713528698754.html), supposedly an excerpt from a book called Battle Hymn of the Tiger Mother. I read it with a smile on my face. Some of the things she wrote is true about some Chinese parent’s attitudes to education and parenting but they are sweeping generalisations. In my own experience, I’m an Australian Born Chinese (ABC). Also known as banana (yellow on the outside, white on the inside). My parents were strict, but not that strict. But still I can definitely relate to being scared bringing my school report home from school, being encouraged to do more homework than prescribed, I did learn the violin and piano and my extra-curricular activities was basically only music related. But I was allowed to watch TV, go in school plays, play computer games, etc. Amy’s post has caused an “uproar” in some areas of the blogging community for all sorts of reasons and I read many of the thoughtful responses over the weekend. I really don’t know where to start but firstly, I feel sorry for her kids. Instead of the selfish and conceited title “Why Chinese Mothers Are Superior“, maybe the post should be titled “Why Chinese children don’t have as much fun“. Now that I’ve done my high school, university and have worked for many years, I wonder whether it’s actually worth it. For example, what’s the point of scoring 100% if you only need 80% to get into the course you want? Once you’re in the workforce, no-one really cares what you scored for what test, how highly placed you were at High School or University. True there is a certain level of scores that you may need to progress to the next step or open up more opportunities, but come on.. A instead of an A+? Taking a few more months to learn The Little White Donkey? Perhaps these “Chinese children” could do extra-curricular activities that they want, study a bit less, have friends over, watch some TV each week, have more a more fun and varied childhood, yet still get into the course they want if that’s the ultimate goal? I guess a cynic could read the article and think, wow, Chinese kids must be pretty dumb if they need so much tuition! And in the end they still get the same jobs as caucasians. Yes I’ve been westernised having been born and brought up in Australia (a second gen Chinese Australian), but to me, happiness, self discipline, self responsibility, learning consequences from your own decisions and actions is more important that an extra percent mark on a test. Yes I see the value in teaching your kids not to give up if things get hard, that they have the potential to achieve greatly if you put in the effort (10,000 hours? ), but is it worth the expense of other facets of a once in a lifetime childhood? Life and time is precious. There are things that one would only experience or do as a child in school. Unfortunately Amy doesn’t touch on the point that I suspect sometimes some Chinese parents are doing this for themselves. It can sometimes be a sort of “show”, upholding their parents pride or face. So you can boast that your child learnt Whizzbang Etude No. 2 at the age of 3 with their right hand only and can play it blindfolded backwards. Or disgrace to your entire family name if you took 1 year to learn The Little White Donkey instead of your cousin who took only 2 weeks. Maybe this is related to the piano and violin thing. What’s the point in saying your daughter/son can play all of John Coltrane’s sax solos at the 7 if all your Chinese parent friends only measure success by violin and piano Suzuki book numbers. Perhaps it’s some in built genetic self preservation mechanism – that if their kids do well, they’ll be successful, earn lots of money, and thus have the money to be able to look after the parents when they’re older. And what with being number 1? By definition, there can ONLY BE ONE PERSON at the number 1 position. What about everyone else in the class/school/country/world? Are they failures? Shouldn’t you be happy if your child genuinely tried their hardest? Now that I’m in the workforce, I’ve learnt that academic scores, although impressive, is not really useful if you don’t have strong people, social or communication skills, haven’t had varied life experiences, don’t take pride in personal presentation, haven’t contributed to the local community or had team building and leadership experiences, through sports or clubs. I think these things make a much more well rounded human than one who just did rote learning for hours on end, who is scared to score an A instead of A+ in every maths test, who is brought up with the mantra that they have failed if they’re not the top of the class or was forced to learn an instrument that they didn’t want to. How about your child trying hard and doing the best they can and if they do, you being proud of that? One of the things that the post raises that frustrates me is the attitude towards music. Yes, Chinese children may be forced to learn the violin and piano, but when it comes to university/college, often they are strongly DISCOURAGED from taking up music as a profession. You must be a doctor or lawyer instead right? Many end up dropping their musical instrument altogether, perhaps suggesting that it was forced upon them instead of playing for the love of it – perhaps even psychologically ruining their attitude towards music later in life. And I also hear some rare stories of people who have done the medical, law thing but then after a few years, given it up to do music instead. If “Chinese mothers” are investing so much of their time and effort into their children to learn a musical instrument, and their children are good at it, then shouldn’t they encourage them to follow through with this into their adult lives? And the other thing I’m frustrated about – as I’ve mentioned in a previous blog post, I’m seeing younger and younger kids nowadays play musical repetoire that is YEARS beyond their emotional maturity. Should a 7 year old even be playing The Little White Donkey? A talented pianist might be able to play the notes, but are they actually making music? Does it matter if a 5 year old can play the Mendelssohn Violin Concerto like a robot with no genuine feeling of love, romance, longing? As some other blogs have said, this is a complex issue and everyone’s got their own thoughts. If anything, this has made people reflect on their own parenting styles and how much influence their heritage/ancestry/own upbringing has played on their parenting style. Also, many of the things Amy raises is not specific to just Chinese parents either. There’s no doubt that Amy Chua loves her children. Everyone has different ways of showing love, and ultimately, as long as her children realise that what she is doing is because that’s the way she’s choosing to show her love and dedication, then all is OK right? The sad thing is that I’ve read that Amy Chua didn’t have any say into the WSJ piece, and that it’s an edited piece of various parts of her book, which coincidentally has launched into the Top 10. Is this all just a marketing ploy to generate interest in the book? Have we been sucked in? One thing that surprised me last Christmas was that Little Miss 11 actually bought presents for each member of our family with her own money. And without us knowing! We were around the Christmas tree on Christmas morning, and Little Miss 11 hands me a present. I thought, OK, Wifey must have gone out with her to buy me a present, or perhaps Wifey bought a present for Little Miss 11 to give to me. I quickly unwrapped it and saw a FIFA 2010 game and a FarmVille Cash Card of $10!!! I was very happy but both Wifey and I were surprised – HOW and WHEN did she buy these?!?!? We have started giving Little Miss 11 a bit of freedom nowadays when we go shopping, as long as she’s with Little Miss 9, has her mobile and only for short periods at a time. I’m guessing that when we were out shopping one day, she must have sneaked into EB Games and bought these things! As a parent, and knowing what little pocket money we give the kids (and not regularly as well), this was an extra special present as it’s a significant chunk of the total amount of money that she has. And to get gaming stuff – very thoughtful indeed! I started trying to think back to wonder at what age did I start buying my parents presents with my own money… hmm… I can’t remember! Unfortunately, the most disturbing aspect of this story for me is Little Miss 11 buying her parent virtual money with her real money. It seems like throwing your money away… But I was super happy in a geeky way – I plugged it into FarmVille then sat down with her to try to decide what new building or decoration I could buy with it. An exciting change when your child passes the toddler ages and is in the Primary School age group, is that they start introducing you to new things. Before then, the world as you knew it was as you knew it. I imagined the information flow streaming from the parent to the child. Even if they went to kindy or daycare, you knew what they were learning. But once they hit Primary School and get older (like 9+ years), they explore other things, learn things that you never knew or can do. Like seeing Miss 9 learn and play the saxophone. I tried blowing through it and got a very unsatisfactory honk. Or Miss 11 learning to read the tenor clef and thumb position on the cello. I just look at the music notes and give up. I can safely say that my girls are now better than me at doing some things! It’s a strange revelation as a parent when this happens – almost like your children have passed another stage of innocent childhood. There’s nothing you can do but to encourage and support them grow. Unfortunately, this has now also extended into iPhone/iPod Touch applications. For a few weeks, I wandered why Miss 11 would rush to her iPod Touch at certain times of the day. And then I saw a note next to her alarm clock “Carrots 7.30AM”. What on earth was she up to? I asked her a few times and she dodged the question like a politician. But eventually she revealed to me that she was playing a game called “We Rule”, what I’ve now found out is a lot like Farmville on Facebook. 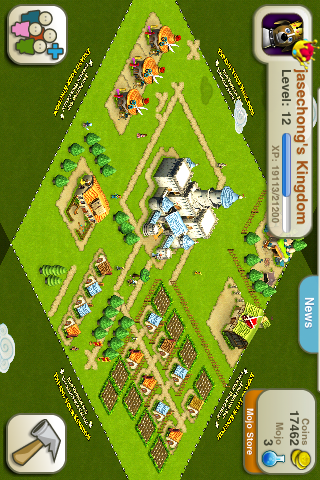 And lo and behold, I’m now ADDICTED to this time wasting game!!! I’m not sure I can even call it a game, is there a winner? But all I know is that I started pulling up my iPhone at certain intervals of the day, checking on my onions, pumpkins, magic cauliflower, building houses, buying shops, moving fences around, saving up for a stable, checking on my daughter’s kingdom and trying to out-do hers. AAARRRGHHHHHH!!! What has she done to me!!!!??!? A week later I had overtaken her on the game… I was so addicted to tending to my little kingdom that even my Wifey and Miss 9 got annoyed. Ahh, kids.. what will they introduce me to next? We’re about to make one of the more important decisions for Miss 10’s life so far – the choice of High School for next year. How do we know if it’s the right choice? What IS the right choice? It’s been an interesting year so far, finding out how the high school thing works. Like many things in life, there isn’t a manual that tells you clearly what to do, or even what options there are. As a bit of background, Miss 10 currently goes to a Catholic Primary School where most kids feed into a particular Catholic High School. So this was obviously our first action – make sure she’s enrolled, attend the Open day, go to the interview, etc. The thing I love about a Catholic High School environment is the general ethos that the school operates on. Catholic High Schools may offer some scholarships, but some don’t as it doesn’t match the ethos of helping those in need instead those who are talented. Fees at Catholic High School are substantially less than other Private High Schools. It may be a sweeping generalisation, but their school resources may not be as top notch and their staff salaries not as high as an elite Private School, but it may force them to use their funding more wisely. As Miss 10 is quite musical, we decided to try to get her into the Education Department’s Gifted and Talented program. This is like an extension program run at particular Public (Government) High Schools. For the music extension, this has involved a general musicality test and a music audition. Next up is an academic test, and then I think there is an interview if she is shortlisted even further. We’re also in the catchment area for a pretty good Public High School, so Miss 10 could just automatically go to the “local” public school if we wanted. Getting into a Private High School is a bit different. I hear that parents nowadays put their kids on the waiting list as soon as they’re born! We didn’t think about this until quite recently and so Miss 10 was apparently “wwwaayyyyy” down the list. Another way of getting into a Private High School is to try out for a scholarship. For Miss 10, going for a music scholarship makes sense. It seems each Private High School has their own entrance/scholarship methods, but for music it generally means a music audition, and maybe an academic test too (usually run by ACER). Guess they don’t want to take fantastic musos who are “dumb”, but since aptitude in music usually correlates to academic results, maybe this is redundant??? So this year, Miss 10 has sat the music audition and the academic test and we’re awaiting the results. Getting a music scholarship from a Private High School will means getting “free” instrumental music lessons, and potentially a discount off school fees too. Although many parents place a lot of importance on this decision, does it really make that much difference to the person in the end? I keep on trying to tell myself – it’s not like you can tell whether someone went to this or that school once they’re an adult! My little Miss 10 goes on her first school camp next week! Little? Well maybe not so little. As per usual, the teacher has asked if any parents would be interested in going on camp to help. Of course! I’d love to! But you know what? Miss 10 doesn’t quite think the same way. Nor does Wifey! No… you don’t want to have your “Dad” at your first school camp (and last for Primary School). That would be wayyyyyy so daggggy! And it’s her time to shine and take another step at independence, so it’s best that I’m not there. At least I know Miss 9 is still extremely excited about having me around in public. I asked her the other day if she wanted me to come up to her classroom to see her new seating position and she beamed a huge smile and gleefully said “Yes!”. When I peeked in, she saw me and did her cute little wave at me and then came to give me a kiss. I’ll cherish this as long as I can!